You are going to Watch One Piece Episode 435 English dubbed online free episodes with HQ / high quality. Stream Anime One Piece Episode 435 Online English dub Mighty Magellan! Bon Clay Bugs Out! Luffy begins fighting Magellan despite Bon Clay’s warnings to flee, and finds that he is unable to go on the offensive because of Magellan’s poisonous body and long-range poison attacks. Bon Clay considers helping him, but knows he would die if he even attempted to do so, and is unable to help, runs away from the battle. 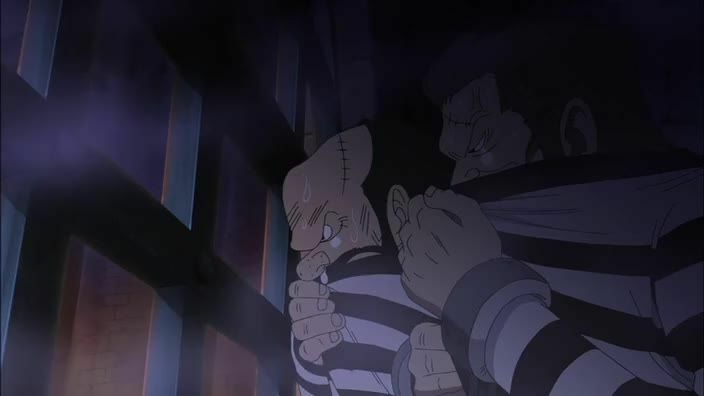 Mr. 3 and Buggy try to escape to higher levels, and while Hannyabal is willing to let them past to get Magellan in trouble, they do not believe him thinking its a trap, and attack him and his guards. Luffy decides to attack even if it means sacrifice himself to attack Magellan. Luffy enters Gear Second and uses Jet Bazooka on him, injuring Magellan and getting poisoned in the process.